Binsey is a village to the west of Oxford, on the south bank of the main channel of the River Thames, opposite Port Meadow, which has been an open space belonging to the burgesses of Oxford since late Saxon times. Although now within the ring-road, the village is essentially rural and unspoilt. The hub of Binsey is a row of cottages and the Perch Inn on one side of the village green. At one time when the river was wider there was a ferry here taking travelers across to Oxford. The church, its present building no earlier than the 12th century though on an older site, lies a third of a mile distant. Its association with Oxford's patron saint St Frideswide alone makes this an evocative place for anyone with an interest in the origins of this great University city. Its holy well, dedicated to St Margaret like the church itself, was a place of resort for those with eye problems or desirous of a child: Katharine of Aragon's lack of success in conceiving a male heir after resort to the well in a sense precipitated the English Reformation! Later associations, which include Charles Dodgson and Alice Liddell as well as Gerard Manley Hopkins and C.
S. Lewis, render Binsey a place for the literary as well as the religious pilgrim. 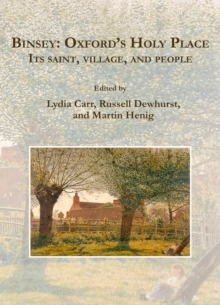 This book is a collection of essays on aspects of Binsey and its environs. It is not a guidebook so much as an evocation of the place, dwelling on specific aspects from the busy river to the tranquil and silent churchyard; from the poplars, great-grandparents of the present trees along the river and Hopkins' great poem on them, to the personalities who served the village community; from the Binsey of St Frideswide's time to the community of the present day.